Nick Cave & The Bad Seeds in Montreal or Quebec City? Inform me about the next events for Nick Cave & The Bad Seeds. 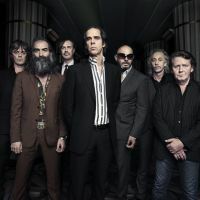 Enroll yourself to our priority waiting list for Nick Cave & The Bad Seeds to be alerted when new tickets are available. Filling this form doesn't engage you to any purchase. You don't want to miss out on the band Nick Cave and the Bad Seeds they will be on stage in Montreal at Métropolis on the 29th of May 2017. Nick Cave is born in 1957 in Australia. He is a singer, author and composer he also holds the hat of writer, poet, screenwriter and sometimes he is an actor. His compositions are deep and rather dark, with some passages from the Bible and often speaks of death. He has a very impressive discography to his credit including 16 albums with the band Nick Cave and the Bad Seeds. The band's last album appeared in 2016 Skeleton Tree refers to the tragic death of his son in 2015.